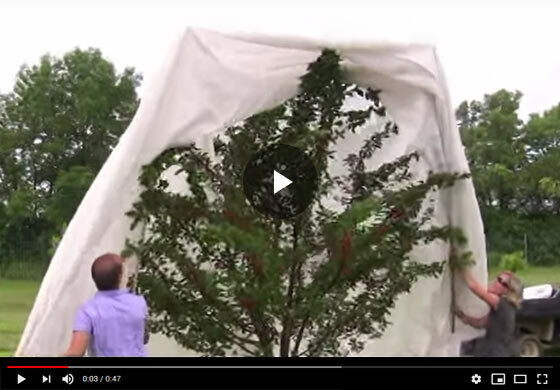 Felix, Gurney's horticulture expert demonstrates the process of installing netting over a tall tree. Learn how to cover the tree without pulling down on the top branches, how to keep the birds and pests away and create an easy access to your fruit. Hi, Felix here with Gurneys and today we're covering the covering process on our tart-cherry, a full-sized tree or an older tree. This happens to be a six year old tart cherry and Sarah here's going to give me a hand, it's a little bit of a process to get this net up above the tree, so you don't knock all your fruit off and break limbs, so she's giving me a hand and we'll start the process, basically use a couple of bamboo post poles to get the net up above the tree and then it'll drape over, we'll show that to you, I want to talk a little bit about the type of netting that we're using today. This is just a nylon mesh and you can see here there's some small gaps to allow some airflow. The key is that your netting segments, the holes in the netting aren't too big, if they're small enough to keep from having the birds' feet get caught in there. They will land on your tree and maybe try to get in your fruit and when they do that, if the holes are too large, they'll actually get caught in it and they won't be able to get out, it'll be an unsightly mess you'll have on hand there so make sure that your openings, this happens to be about a quarter inch sized opening, square opening on this mesh, I wouldn't go any larger than that and that's really the ideal size, you can get that from Gurney's. Today we're using a little finer mesh here for this tree, but any mesh will work as long as the air flow can get through it and for the short period of time we're going to have this on the tree, just a couple of weeks, ripening, when the cherries start coloring up, we want to pick them, it's not going to hurt the tree. One of the things I like to do to keep those upper branches from leaning over too much under the weight, is to just give a little slack up in the center, make sure it's not pushing down, if the tension is pulling down too much on those limbs, it'll do it a little bit, but not too much. You can see here we have plenty, it's going down to our ground. The next step is really just going to wrap around the base and tie it off our under trunk, so the birds can't get in underneath this particular material. Alright, the final step here with this larger cherry tree is to tie off the base. In a high wind environment, you'll get a lot of this netting will just blow open and you'll have access for birds, so we're going to tie off around the trunk with a piece of twine. That's really the final step. When you want access to it, you have to unwind this, undo where your tie off points are and get under the tree and pick your fruit, but this keeps the birds out from the base.